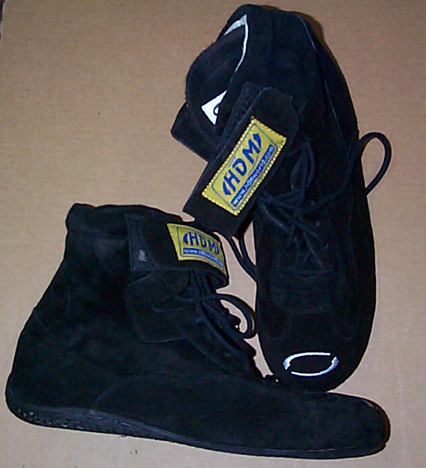 HDM is proud to offer our own line of Racing Shoes. These shoes are constructed with a oil resistant rubber sole, leather outer shell, and nomex liner. These shoes are SFI tagged and rated 3.3/5. The shoes lace up on the instep and have an adjustable hook-and-loop (velcro) ankle closure. We currently are only stocking black shoes as shown in the picture and are trying to keep adult sizes 5-12 on the shelf. We also have a few 1/2 sizes, so be sure to contact us to ensure we have your size before you purchase. If you have any questions regarding our jackets, please email us... we will be glad to help.